This boxing camp offers you the rare opportunity to train with elite Cuban boxers in Havana. 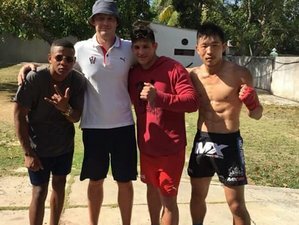 This is a vacation dedicated to refining your technique and whipping you into shape in a country that is renowned for producing the world’s most successful amateur fighters. Your boxing program will be led by world-class trainers. Whether you just want to boost your fitness or advance your skills, you will have an experience of a lifetime. While in Cuba, you will be staying at a Cuban private house, 3/52 playa, Havana. During this camp, you will be training in the Pan American Stadium, or Estadio Panamericano, Cuba’s iconic venue built to host the 1991 Pan American Games. Today, the stadium is mainly used for athletics, baseball, soccer, and as a training ground for ambitious sports students from the local university. Don’t be fooled by the exterior of the building. Yes, it could use some paint, but the gym you will be training in has been recently renovated, giving you the equipment needed for an excellent standard of training. The other stadium facilities are also well maintained. Besides, Cuba Boxing and Fitness are confident you will relish the opportunity to train at one of Cuba’s most famous landmarks. This boxing training program is open to both men and women, from beginners to semi-pros. The people of Cuba treat boxing as an art form, not just a sport. Boxing is passionate and intelligent. Military-style training is combined with dance, rhythm, and salsa music. Fluid movements are matched with ambition and a cast-iron focus. It is a force to be reckoned with. Cuban boxing programs remain some of the best on the planet, yet it is still relatively unknown among boxers. Teófilo Stevenson Lawrence, Félix Savón, José Nápoles, and Kid Chocolate are just a few of the boxing heroes to have come out of Cuba’s gyms. Children learn to box at school. The most gifted students are selected to go to specialized schools, where they focus on honing their talents. With former champions supporting them, they devote their energy to training and preparing to become Cuba’s future Olympians. In a country where professional sport was banned in 1962, competitive amateur boxing is still encouraged. Despite limited training resources, the quality of Cuban boxing training is second-to-none. 05.30 - 07.00: Cardio and conditioning. 16.30 - 18.00: Skill and technique. 05.30 - 07.00: Skill and technique. 15.00 - 16.00: Strength and conditioning. 16.00 - 16.30: Pad work. 05:30 - 07.00: Cardio and conditioning. 05.30am - 07.00: Skill and technique. 16.00 - 17.00: Skill and technique. 10.00 - 11.00: Skill and technique. In the evenings, you are free to go out and explore the local beach resort of Guanabo or Havana. This training will take place in Guanabo, a popular spot for Cubans and tourists with nightlife, places to eat, and shops with artisan crafts. Guanabo is a beach town in the Ciudad de la Habana Province of Cuba. It is a ward located within the municipality of Habana del Este, halfway between the center of Havana and Santa Cruz del Norte, at the mouth of the Guanabo River, between the Atlantic Ocean coast and the Sierra del Canchón mountain range. During this camp, you will be served daily breakfast at your accommodation. Please book your flight to arrive at José Martí International Airport (HAV). Transfer from and to the airport is included. Cuba Boxing and Fitness will pick you up from the airport. Airport: José Martí International Airport Airport transfer included: José Martí International Airport No additional charges. You can request this in the next step. Cuba Boxing & Fitness offers you the rare opportunity to train with elite Cuban boxers in Havana. This vacation is available with arrival on Mondays.